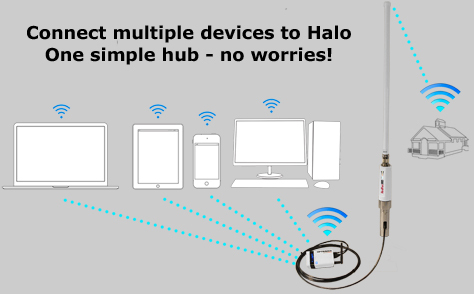 The Redport Halo long-range WiFi extender system takes a weak WiFi signal – at a marina, or truck stop, or basecamp – and powerfully boosts it, repeating it back to you up to 7 miles away in perfect conditions. Allows to capture weak signal from free or low-cost distant Wi-Fi networks. Internet connection ready, no software subscription is needed. Compatible with most satellite phones and data terminals. NMEA compatible. Broadcast your NMEA data (GPS location, AIS, weather data) to your navigational software. NOT INCLUDED: RedPort Optimizer wXa-122, can be ordered together.